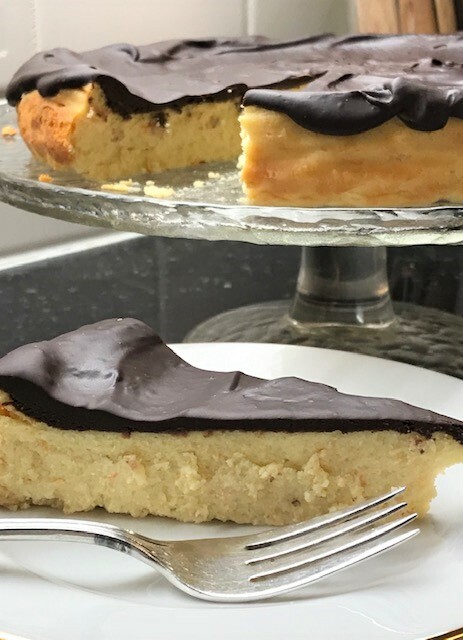 This lighter version of cheesecake is an awesome combination of orange and chocolate. Make it the night before for cheesecake perfection. You’ll need a food processor, a stand mixer or an electric beater to make it. Put the unopened can of mandarin oranges in the fridge overnight. Make sure the rack in the oven is in the middle. Preheat the oven to 350 °F (180° C). Line an 8-inch (2L) spring form pan bottom with a circle of parchment paper and a strip of parchment paper for the sides. Set aside. Read sidebar about smooth ricotta cheese. Beat together the cream cheese in a large bowl or in the food processor until just smooth. Don’t go crazy and overbeat it, it just adds air which will cayuse the cheesecake to crack. Add ricotta, sugar, and flour and gently beat in until smooth. Add eggs, yogurt, orange juice concentrate and rind and once again gently beat until combined. Pour into the prepared pan and bake for 50 minutes. Turn off oven and let sit for 10 minutes. Remove from oven and place on a cooling rack. When completely cooled, cover and refrigerate in the pan overnight. The next day remove the cheesecake from pan, carefully remove the parchment paper on the underneath side, and place on a flat cake plate. If the cake has any moisture on the top lay a clean paper towel on top to absorb any excess moisture. Open the can of mandarin oranges and drain well. Store in fridge till serving time. Prepare glaze: break chocolate into small pieces place in a small pot. Add orange juice concentrate. Place over low heat and stir until just melted. Pour over the top of the cake, spreading out and letting run over the edge of the cheesecake. Let set for at least 30 minutes. Store in the fridge until 30 minutes before serving time. Cut into serving size pieces, makes 12 slices, and serve with mandarin orange slices and mint leaves if desired. Any leftovers can be stored covered in the fridge for up to three days. Make sure the ricotta is smooth. If you can’t find any smooth ricotta whirl the regular light ricotta in a food processor until smooth. Frozen Orange Juice Concentrate – I leave the container of frozen orange juice concentrate in my freezer and scoop out what I need for the recipe. I used 12 squares of a Dove Dark 71% Cacao 100 g chocolate bar which works out to be (66 g) a tad more than needed, whoops! OR use your favourite brand.